"This is a beautiful book that takes us on a rich and varied journey connecting us deeply to the many shapes that Dance Movement Psychotherapy in practice can take. We are invited to experience from different perspectives the Dance Movement Psychotherapist in their many ways of ‘being with’ people with learning disabilities. A strong theme that emerges is how DMP aims to accommodate diversity rather than fix difference and for some people the DMP becomes an interpreter of emotional response between their client and the other significant people within their supportive network. I particularly enjoyed hearing about how DMP enhanced communication for three young men and how their experience led their mother to train to become a DMP herself." "This thoughtful, informative and accessible book reflects current dance movement psychotherapy practice with people with learning disabilities. It is an essential resource for anyone working or training in the field of learning disability or therapy. Writers share their experience and their own learning with moving personal honesty and sensitivity to existentially challenging themes"
Anna Chesner is a UKCP registered psychodrama and group analytic psychotherapist and supervisor. She is co-director London Centre for Psychodrama Group and Individual Psychotherapy and programme lead of its cross-professional Creative Supervision Diploma training. 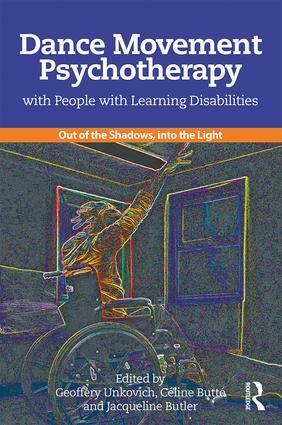 "I strongly recommend this thought provoking book to therapists of all therapeutic backgrounds who work with people with learning difficulties. Through a vivid range of case studies and vignettes the authors apply Dance Movement Psychotherapy theory and demonstrate clearly the wide range of benefits their clients experience through this wonderfully creative method. This rich book adds significant insights into the lives of people with learning difficulties and the ways in which therapy can reduce isolation and enrich lives"
"In this moving, informative and seminal book Dance Movement Therapy has come of age. It has always had its own longstanding rigorous professional history, but this book is for all professionals and citizens concerned for the therapeutic development and treatment of learning disabled children and adults. From the invitation for us to recognise the position in which we read this book both literally and metaphorically and try a different position now and again, we enter an authentic dialogue with the authors, who cover a wide range of settings, personal and professional experiences, themes of loss, identity, joy, sexuality and death with respect and transparency. The authors have applied many of the major theoretical advances in verbal therapies to their work and as a result of this book, other professionals will now reference and have a greater understanding of what dance movement therapy offers"
Geoffery Unkovich has extensive DMP experience through eleven years’ practice with adults with learning disabilities. Geoffery was on ADMP UK council for four years, and is currently on their Professional Development Committee. He is a senior lecturer in DMP at the University of Roehampton, and has taught on DMP training programmes at Goldsmiths, University of London, in Croatia and Romania. Céline Butté has been practising DMP for fifteen years. She works within Merton Arts Therapies team for People with Learning Disabilities and in private practice. A core member of the teaching team on the Creative Approaches to Supervision training with the London Centre for Psychodrama, she also teaches DMP/T internationally. Céline has provided DMP within NHS adult Mental Health services and for refugees and their children. Jacqueline Butler has been practicing as a Dance Movement Psychotherapist for eighteen years. Her DMP work is with adults with learning disabilities for a Local Government Direct Service and for private care-providers, in a therapeutic community for those with mental health issues and she also has a private practice for individuals and supervisees. She is a visiting lecturer in Dance Movement Psychotherapy at the University of Roehampton, London.